Miranda, is one of central northern and coaster state of Venezuela and its was named in honor to the "Generalissimo" (Great Field Marshall) Francisco de Miranda, one of the most illustrious Venezuelan heroes and precursor of South American Independence, who takes part in the French and the American Revolutions. The Miranda State flag is divided in two horizontal and equivalent stripes: the blue (above) represents the "Tuy", the most important river of the state, whilst the green stripe (below) symbolizes the fertile grounds of the region. The rising sun reminds the warms coast and beaches of the entity and the cocoa branches represents the agricultural riches of the land. The Mirandian Coat of Arms is divided per bend. The first quarter (above) shows a ship over quiet sea representing the commerce. The central bend in vert (green) symbolizes the hope whilst the silvered star in the top remind the peace. The third quarter (below) presents a natural landscape with the Tuy River in the middle of a forest with cattle represents the riches of the land. The cornucopias crowning the shield are symbols of abundance. 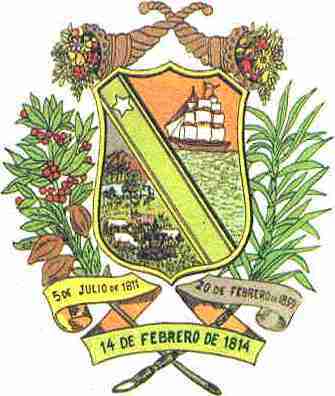 The sugarcane, coffee and cocoa branches at its sides are the principal agricultural products of the state and the three-colored pennant charge how mottoes the followings ephemeris "5 de Julio de 1811" (July 5th, 1811) "20 de Febrero de 1859" (February 20th, 1859) and "14 de Febrero de 1814' (February 14th, 1814). Here is image of the flag as it appears at the official site<www.miranda.gov.ve>.